Over 1000 patches for weapons and shields that were not Dual Sheath Redux compatible. These will benefit All Geared Up users as well. I am taking requests in place of Neovalen and adding them to an auto-detecting FOMOD installer over time. - Colorful Magic (Didn't test all, report any errors if any please). Fixed Draugr Weaponry FOMOD Installer error and added replacer meshes. - Corrected two spelling errors in the fomod installer. This is not the same as the outdated optional file on the official DSR page. This is a fully working and updated patch with 299 new meshes. Every single stave was tested and working with the exception of the Dragon Priest defender staff. - Fixed a mistake with the Dwarven Axes "Left" nif. This is a compilation of over 1000 patches made to support weapons, shields, and staves that were incompatible with Neovalen's Dual Sheath Redux. These mesh packs contain only meshes and no textures, esps, or anything else. You still need to download the original mods they are made for. I am taking requests in place of Neovalen and William who are very busy these days. These should benefit and work for those who use All Geared Up. Once installed through your mod manager, a FOMOD installer will start upon activation and will check to see what mods you have. It will then select exactly which patches you need to make life really easy for you. It will not choose or install patches you do not need. If you would like to contribute to the list, send me a PM or contact me on my YouTube Channel or Facebook page. Please make sure you ask for permission from any mod authors you wish to make a mesh pack for. I will not host it here without their permission or before checking their permissions tab on their mod page. I'm very fortunate to have gotten permission for all of the mods included in this pack and am grateful to all of the hard working mod authors credited next to the patched mods below. I have made a video tutorial above showing you how to make patches for swords with more tutorials for other types of patches on the way :). Each and every mesh pack has been tested by me in game on both hips and back with XP32 Maximum Skeleton. 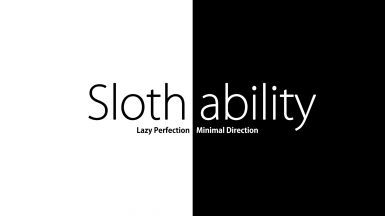 That's not to say there won't be any mistakes, I'm only one Sloth after all. There are a few known issues with belt loops and I will fix this using 3DS Max soon. First activate the mod in your mod manager. I have only tested this with the Nexus Mod Manager myself. Let the installer check and automatically select the patches you need. Double check the list and select "Finish." We are not done yet though! Before you do anything else, make sure both the Dual Sheath Redux.esp and Dual Sheath Redux Patch.esp are at the bottom of your load order. 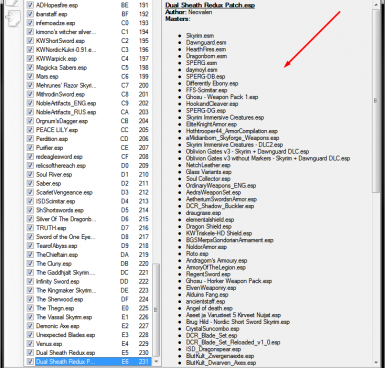 Then we need to go into our Skyrim data folder and manually delete the old Dual Sheath Redux Patch.esp. Now it's time to create a fresh patch that will include all the previously unsupported mods and ensure the patches work in game. 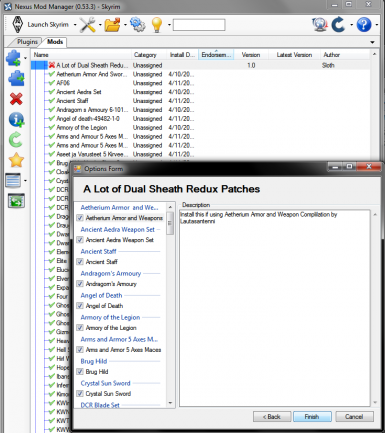 Go into your Skyproc Patchers folder from Dual Sheath Redux and create a new patch. Lastly, restart your mod manager and make sure the Dual Sheath Redux Patch.esp is there, active and lists the mods you wanted patched. With that, you have properly installed these patches and should see the changes next time you load up your game. Uninstallation is simple, safe and done through the mod manager. Thank you to all of the Mod Authors whose names appeared next to their supported weapon above. Each and every one was very kind and responded quickly to my messages regarding permissions. I found some incredible weapons through doing this project and hope to showcase many of them on my YouTube channel in the near future. Thank you to Neovalen and WilliamImm's tutorials on how to create compatible mesh packs for Dual Sheath Redux and empowering users to make patches like this possible. You can find these under the files section of Dual Sheath Redux and I encourage you to give it a shot. If you don't already know, I make in-depth and voiced Tutorials among other things on my channel, here's a couple examples. Hope I can help, cheers.